The Whole North Korea Thing… What’s Up With That? 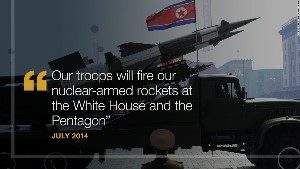 But in reality, can someone help us better understand North Korean regime’s thinking on this? 8. IMPACT THOUSANDS OF LIVES FOR CHRIST IN ORLANDO, FL!! 9. WHAT A GREAT WEEK FOR BRIGADA! 3. “BORN IS THE KING!” (UNIQUE CHRISTMAS STATIONERY) — Use this uniquely designed stationery to remind everyone you know of the true meaning of Christmas. Packages of 50 sheets of letterhead or 50 matching envelopes are available for $5.00 each through the Caspari Center office by calling 630-668-3328 or emailing caspariusa(at)caspari(dot)com [As a means of preventing spam for our contributors, in the preceding email address(es), please replace (at) with @ and (dot) with .] You can also view a sample and order the stationery through their web site at http://www.caspari.com Shipping is only available within the U.S. and at an additional cost. 4. INTERNATIONAL WEEK OF PRAYER FOR NORTH KOREA 2005 — NK Missions, the World Network for North Korea Missions, is mobilizing 100 prayer meetings for North Korea in homes around the world during Dec. 4-11, the International Week of Prayer for North Korea. You may sign up for a leader’s kit online at http://www.nkmissions.com They actually were hoping to get you signed up by November 23, but maybe you can still talk them out of a kit. Cost is $10, but scholarships are available for those in developing countries. 8. IMPACT THOUSANDS OF LIVES FOR CHRIST IN ORLANDO, FL!! — Delta Ministries International is partnering with the Luis Palau Association to bring individuals and teams to Orlando, FL to serve in various venues demonstrating the love of God in a “two-handed” Gospel approach. The first hand will be the week leading up to the Orlando Festival (Operation Compassion). Teams will be involved in practical displays of Jesus’ love including saturation evangelism, prayer walking, restoring homes, random acts of kindness and Habitat for Humanity. The second hand will be the gospel proclamation given by Dr. Luis Palau. Involvement needed for the two days of the Orlando Festival include humanitarian projects, children’s area, setup and takedown for the festival, counselors and prayer teams. The dates are March 25 – April 3, 2006. To learn more, email ashers(at)deltaministries(dot)com [As a means of preventing spam for our contributors, in the preceding email address(es), please replace (at) with @ and (dot) with .] or visit http://www.deltaministries.com/ or call 1-800-533-5822 in the USA or call +1-1800-533-5822. 9. WHAT A GREAT WEEK FOR BRIGADA! — We heard several encouraging words… $15.52 from Blessed Hope Communication (when you sign up to use their long distance service, they make an offering to Brigada in relation to your minutes “on the air”… so — please reach out and touch someone! :-) To learn more, just click to: http://www.lowermyphonebill.com/brigada We also received $200 from Asbury United Methodist Church (Thank you!!! ), and from anonymous partners, we received gifts of $5, $20, and $25. This latter gift was from an anonymous missionary working with Greater Europe Mission. To these new partners of Brigada, we appreciate you!!! 10. MAKE A HUGE DIFFERENCE WITH A SMALL AMOUNT — Don’t forget that with Brigada, the tiniest gift means so very much. Just click on “sponsor” in the top menu (to use PayPal or a credit card), or just send a check payable to Team Expansion to: Team Expansion (Brigada secretary), 13711 Willow Reed Dr., Louisville, KY 40299. As always, be sure to let us know if you’d like us to promote any particular service or ministry, or if you’d prefer your gift be anonymous. 11. THE BACKPAGE: “LORD, TEACH ME ABOUT THE ECONOMY” — I continue to be in awe of those who understand big business. I have a lawyer friend who understands Washington, history, Wall Street… you know the type. Me? I’m mystified by it all. The preaching minister at our church told me that cumulative spending on world evangelism for 2004 was $1.7 billion. He also said sales figures for Sony Playstations were exactly the same: $1.7 billion. We’ve all heard illustrations like that. I’m sure you have a favorite one about dog food or pet supplies. The point is — how does all this economy of scale work? And does it at all relate to World Evangelism? On the one hand, I’m thinking the Lord can do whatever He wants to do, with or without the USA fiscal budget, Sony, or the country of San Marino. He owns the cattle on a thousand hills… All he has to do is sell a few head and your next mission project is totally covered. On the other hand, it *is* sobering how much we spend on small stuff. And it’s telling how much our *supporters* have spent on small stuff… stuff that really won’t matter. So here’s the thought for the day: Today, let’s all contemplate for a minute about the fact that, when we appeal for someone to give toward our upcoming mission project, we know deep down inside we’re asking them to give toward something that will *matter*… something that will *last*. If we’re convinced of that, then why are we so sheepish asking for money. Next time we have doubts about asking for funds, let’s all remember that if they don’t give toward the particular mission work in which we’re engaging, they’ll probably just use it to buy video games anyway. :-) And that, my friends, … that tiny change in our way of thinking… that can make all the difference. THANKS TO THOSE PARTNERING WITH US! 10,000 PRAYERS FOR NORTH KOREA LAUNCHED! NEED DATA COMM OR VOICE COMM INTO DIFFICULT AREAS? THANKS TO THOSE PARTNERING WITH US! — Thanks *tons* to those partnering with us as sponsors. Included this week are Charmaine (who sent $40 via PayPal) and Eric (writing from Sweden, having sent $25, commented, “Doug, … I rejoice in the Lord for all that Brigada has meant to me over the years. I can’t remember when I first subscribed, but its been a good while. I may be like many an ole missionary who reads them, or more accurately, scans them, gleans from them and thanks God for your labor to put it together! Please know that you have ministered to me through your labor many times and more than once I found more than information, I found motivation! God Bless YOU and the team, e” — Thanks Eric!). These anonymous partners aren’t giving to promote the sale of a product. They just believe in the Brigada “Cause”. They’ve been added to our sponsors page at: http://www.brigada.org then click on “Sponsors” Thanks to your gifts and our new secretary, we’re catching up on a back-log of Brigada Today editions that were way too far delayed. Thanks for your patience!!! SHORT-TERM MISSION TRIP LEADERSHIP MANUALS — Innovative Mission Opportunities’ http://www.imoi.org mission is to share Jesus with those people groups that have never heard His name or the truth about Him. Innovative staff leads two week trips into the 10/40 Window. Innovative is wanting to write a manual for team leaders. Do any readers know of any manuals out there Innovative may be able to obtain for ideas and assistance? Innovative has a basic outline of what to include in their manual but thought they might get some other ideas and suggestions from other manuals/organizations. Members of the staff have read about short-term trip leading training on Brigada. Please contact rpickens imoi org with any questions. Once they complete their team leader manual, we’ll ask Innovative to make copies available here on Brigada. MISSIONARY TRAINING CAMPS — Something has happened in your heart, you feel you have a call to missions involvement; now what do you do? The Missionary Training Camps present a wide range of spiritual and practical issues to help people prepare for missions work. Pastors, missions leaders, prayer warriors, those called to short term and career missions have attended the camps. One worker, now in the 10-40 window, said the camp jump started his missions call. For those desiring further help, mentorship and certification follow the camps. The next missionary training camp is in Virginia, October 2-5, 2003. For details regarding training content, dates, places of other upcoming camps, see the Elijah Company web site at http://www.elijahcompany.org or write to info elijahcompany org or call (757) 639-2906. MISSIONS MAPS ON CD-ROM AVAILABLE NOW! NEED POWER FOR THAT LAPTOP? TRY SOLAR! “OSCAR” INFORMATION SERVICE LAUNCHES NEW SECTION — OSCAR, the UK Information Service for World Mission, this month launches a new section of the OSCAR website called the ‘Supporter Index’. This section is specifically for those who are, or wish to be, involved in supporting or facilitating world mission. You’ll be amazed at what you can do without even leaving your home! There is information on the different ways you can assist and support mission work including a comprehensive listing of UK world mission events. A sub-section on communications includes advice and links for using the Internet, email, telephone and post for keeping in touch with folk around the world. The launch of this new section comes one month after the successful launch of OSCAR’s Mission Mobilisers Forum that has been buzzing with activity ever since. To access the OSCAR website, go to http://www.oscar.org.uk.